Vintage “Hellerball” has the fighting Iowa baseball team one win from history – and the NCAA Tournament. OMAHA, Neb. — Vintage “Hellerball” has the fighting Iowa baseball team one win from history — and the NCAA Tournament. The Hawkeyes used salty pitching, slick defense and scrappy offense to pound Maryland, 11-0, on Saturday and advance to Sunday’s 1 p.m. Big Ten Conference championship game. Iowa (30-25) has finished second twice in the Big Ten tournament, which began in 1981, but has never won it. It has a one-game shot to break that drought here at TD Ameritrade Park against either Michigan State or Ohio State — who were set to fight it out at 9 a.m. Sunday morning. If the Hawkeyes win, they’ll earn that Big Ten’s automatic berth for one of 16 NCAA regional sites that will be announced Monday. Last year, Iowa used a dominant regular season to earn an at-large spot for its fourth NCAA trip in school history and first in 25 years. There's no at-large fallback plan this year after a spotty regular season. If Iowa wins Sunday, its season continues. If not, it's over. "We always talk at the beginning of the school year in August, we want to be playing in June," third-year coach Rick Heller said. "And the only way they were going to do it this year was to win this tournament. So you see a bunch of guys fighting, but they’re not fighting with panic. They’re fighting because they really enjoy playing the game; they enjoy playing with each other." The eighth-seeded Hawkeyes are playing loose. And Saturday, that meant they were humming. They got three effective innings from Shane Ritter, a true freshman making his second career start. Long reliever Nick Gallagher closed the door from there, eliminating the Terrapins (30-27) with six innings of one-hit ball with nine strikeouts to improve to 8-3. Gallagher has been filthy-good as a reliever in his last four outings: 23⅓ innings, 25 strikeouts and a 0.38 ERA. And he's been battling a groin injury, which forces him to pitch out of the stretch. Ritter and Gallagher got exceptional defense in the combined four-hitter, most notably from shortstop Nick Roscetti. That helped keep the score 0-0 until the fourth inning. 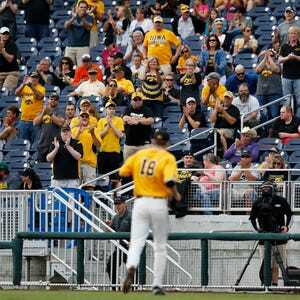 That's when Hellerball was on display for the thousands of Hawkeye fans who showed up for the 9 a.m. first pitch. Hellerball doesn’t have an official definition, but it’s a term named for their coach that became popular in 2015 as a magical season unfolded. It basically means doing the little things right, never giving up, scrapping for every edge. That's what happened in Iowa's breakthrough three-run fourth inning. Mason McCoy fell behind 1-2 in the count, but fought his way to first base with a one-out walk. Austin Guzzo did the same, except he battled back from 0-2. Freshman Robert Neustrom made Maryland pay for two free passes. He squared his bat barrel into freshman Hunter Parsons' delivery for a single to deep right field, giving Iowa a 1-0 lead it wouldn’t relinquish. Hellerball also means pushing the right buttons. Heller got Neustrom running with Parsons' 2-2 pitch to Daniel Aaron Moriel, who swung and rolled a slow grounder toward suddenly-out-of-position shortstop Kevin Smith. It squirted through for a 2-0 lead. A sacrifice fly by Eric Schenck-Joblinske on a 3-2 pitch made it 3-0. The thing about Hellerball, it never stops. It's like an offensive line wearing down a defensive line in football. And in the fourth quarter, if done correctly, the opponent breaks. The Hawkeyes blew the game open with a five-run eighth inning against Maryland's beleaguered pitching staff and tacked on three more insurance runs in the ninth. In the process, they locked up the program’s third straight 30-win season, something that hadn't happened since 1983-85. Yet their biggest game is on deck. And it'll be all pitching hands on deck. Senior right-hander Calvin Mathews is the most likely starter. Heller said long reliever Ryan Erickson would definitely pitch, and No. 1 starter C.J. Eldred would be available on three days' rest, if necessary. Closer Zach Daniels hasn't pitched this week, and effective lefty Nick Allgeyer is fresh. It's about as good a situation as Heller could hope for with Iowa's season on the line.